How was your weekend? It's cold here in Atlanta, brrrr....make me not want to do anything! Friday I got off of work early and ended up going on a major shopping spree to Dior, Sephora, MAC and Bobbi Brown...yikes! I ended up spending over $300 just because I felt like it. I ended up getting a few things I had been eyeing. Of course, when I got home I told the boyfriend about my haul and he brought me back down to reality. I ended up returning half the stuff on Sunday but kept a good amount still! I'll do a haul on that one next! Friday night I also went to Morehouse College, my BF's alma mater, and we saw a Christmas concert by the Morehouse and Spelman glee clubs...it was my first Christmas concert of the year, yay! It was nice to go, but some of the singing was a little off, lol...the glee clubs performed better separate, in my opinion, then together. It seemed like the guys and gals tried to throw some songs together last minute which paled in comparison to their individual pieces. So this is wayyyy overdue. I just haven't gotten around to posting my haul from the Sephora Friends and Family sale. But in case you were wondering, I still decided to post it. evidenced by my smaller hauls (which clearly I didn't stick too with this recent haul!). After much debate I decided on just a few things. Haul in packaging, along with samples. I got this for my kit. I really needed a good concealer palette for darker skin tones. I've been having difficulty correcting undereye circles lately. My girl May said she used these and I had been eyeing them for a while...so I jumped on the bandwagon. I've used just hte orange color at the right end of the palette. Let me say, this is a miracle worker for dark circles on women of color! For reals! The whole palette is worth it just for that one color alone. Now I need to remember to use some of the other colors! I've been really trying to get into NARS lately, but it's just so darn expensive! So far I've picked up a few items which are all usually duos so that I can get more for my money. This palette was a great deal. 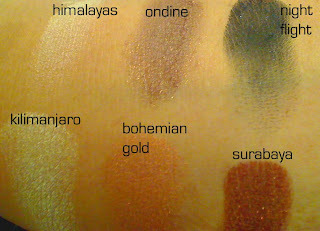 I swatched it in store and was amazed at the vibrancy of the colors. However, when I received it at played with it a bit, I'm not sure that these colors are for me. Don't get me wrong, they are super pigmented and a dream. I'm going to give it another shot...if not I might return. I've been eyeing some of those Cargo eyeshadow palettes...I swatched them in the store and fell in love! First off, this is the cutest little package ever! The box is magnetic so you could definitely reuse it. 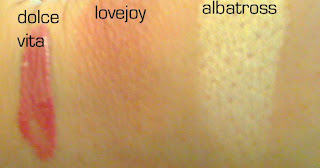 This if my first NARS blush in lovejoy and it comes with Albatross as a highlighter. Love love love! I can't get over how great it is! It's the perfect color and albatross is one of the few highlighters i've met that never sticks patchy on the skin...it's so smooth. I might even venture to say that it's my top highlighter of all time? The lipgloss is also a really great color...mauvey and natural. I'm so glad I got this! Lastly, I picked up a gift for my BFF, but she might read this so I'm not telling! I did pretty good...I spent around $100. Next item to pick up...penultimate liners from the Chill Collection! i love nars blushes too! wes: thanks hon! i'm still getting used to the bangs! nic nic: girl i just picked up two more this weekend...taos (for me) and exhibit a (for the kit)! aww can't wait to see the vid. great haul. 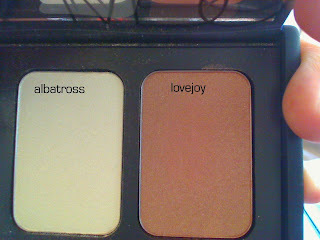 i love lovejoy.... tell me if you think it's close to mac's mineralized blush lovejoy if you have it. can't wait to see the review on the concealer!!!! i picked up a palette (i think one shade lighter) a while ago, but i'm on the fence. those palettes are amazing. great choices. Hi there-wow, you got some lovely pieces here, glad you had a good weekend too! 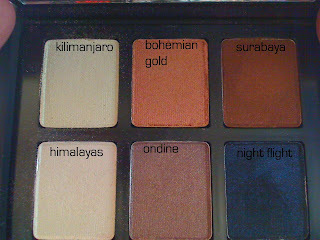 Love that eye shadow palette!! I wish we had Makeup Forever in Aus, it seems like such a great brand.